a car and a red pen is on a calculator. cost of gasoline, wear and insurance. car costs are not paid by commuter tax. Other factors: Other factors like age and gender of the client is also sometimes considered while deciding the premium of the car insurance. If the individual is less than 25 years of age, he is likely to have more accidents and hence may be asked to pay more premium. Luxury cars like BMW and Merc have a higher insurance premium as compared to the mid-range category of cars because the parts of the luxury cars come with a higher price. For the same reasons, SUV premium will be higher than the sedan or hatchback four wheelers. Even the price of the premium is higher in the higher density areas as the chances of accidents there is more. A CNG fitted car will have a higher amount as compared to the petrol or diesel variant. 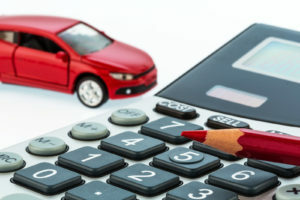 If you have these factors in mind, you’d be able to understand why you have to pay a certain amount on car insurance premium. Your money needs to be justified when being spent. Car insurance calculator will help you do just that.